SCOTLAND'S richest flat race meeting - the totesport Ayr Gold Cup Festival has just become richer, and will hit the £500,000 mark in prize money for the first time ever this year. Picture shows: Fonthill Road, the winner of the Gold Cup 2006 at Ayr Racecourse. The festival, which runs from Thursday September 20 through until Saturday September 22, features three Class 1 races in addition to the Gold Cup and the Silver Cup, both Class 2 events, and many more great races. Both the Laundry Cottage Stud Firth Of Clyde Stakes, a Group 3 event, and the Doonside Cup, a Listed Race, have £10,000 increases to their prize funds, making the cash on offer £60,000 and £50,000 respectively. The 28 runners which will contest the totesport Ayr Gold Cup, Europe’s richest sprint handicap, will be vying for a share of £121,000 - while the similar sized field in the totesport Ayr Silver Cup will be chasing £35,000. 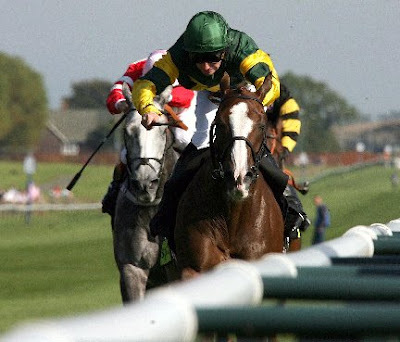 Other notable races include the Knight Frank Handicap for the Kilkerran Cup (£20,000), the James Barr Chartered Surveyors Harry Roseberry Stakes, a Listed Race (£30,000) and the Totescoop6 Ayrshire Handicap Stakes (£25,000). Ayr Racecourse managing director Richard Johnstone said: “It is a bit of a landmark to hit £500,000 in prize money for the Gold Cup Festival. In addition to the Gold Cup and Silver Cup we are keen to build the likes of the Doonside Cup and Firth Of Clyde Stakes. “The latter this year is sponsored for the first time by Laundry Cottage Stud, which is actually owned by a Scot in Colin Bryce, and I am delighted by that. Advance bookings are being taken for the totesport Ayr Gold Cup Festival, and there is 10% discount for single bookings or 20% for parties of 20 or more. Both offers are subject to bookings being made seven or more days in advance, and you can book online at www.ayr-racecourse.co.uk or by telephoning 0870-8505666.